Sadie came into my life the summer of 2000. I was working at my first of many vet tech jobs. Sadie came in after being hit by a car. She was a small (30 pounds or so) 5 month old puppy. Despite having a huge gaping wound on her rear leg, she was wagging her tail as if to say “It’s ok. Don’t worry about me”, an attitude Sadie kept her entire 12 years and 9 months on this earth. After having surgery and multiple bandage changes, Sadie’s owners didn’t come back for her because they didn’t have the money for her care. Of course, by that time I had fallen in love with Sadie. I convinced my husband one night after happy hour that we needed a pit bull puppy! Boy, was he surprised when a happy, bouncy, bandaged puppy was waiting for him when he got home the next day! 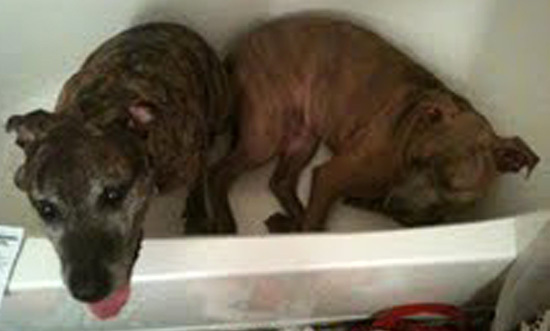 Dan quickly fell in love with his “Daddy’s girl” and they were often found taking naps together. As Sadie grew up we noticed her drive for retrieving things. Balls, frisbees, rocks – you name it, Sadie would get it. As soon as her leg was healed she learned to swim. One day, when we weren’t throwing things in the reservoir for her, she decided to make her own game. She put her head underwater and started collecting big rocks from the bottom. 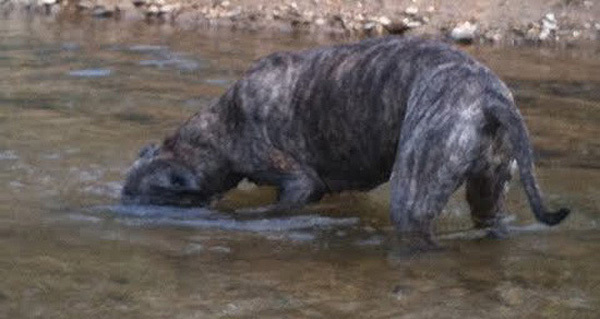 Sadie would sometimes hold her breath for long periods of time while rooting along looking for the right rock. When she was done she’d make a big pile on the shore. Sadie loved swimming and fetching so much that when we took her to the beach she would take her toys up to complete strangers to have them throw for her! Sadie had a unique bark, almost like a seal, and would bark if you weren’t fast enough for her! She loved the beach and we always made a point of taking her on every vacation with us. When Sadie was 5 we adopted a cat named King Henry. He wasn’t the first cat we looked at. It was explained to us that he was “a bit of a bully with the other cats” so it seemed like he would be a good fit with Sadie. It sure was. He and Sadie had a mutual respect for each other. Henry would sometimes put Sadie in her place and Sadie knew he was the boss. Right before her 10th birthday we adopted Rocco. It was a blessing that Rocco had Sadie in his life. She taught him not to be afraid of people and how to enjoy the world around him. He followed her everywhere and admired how brave she was. 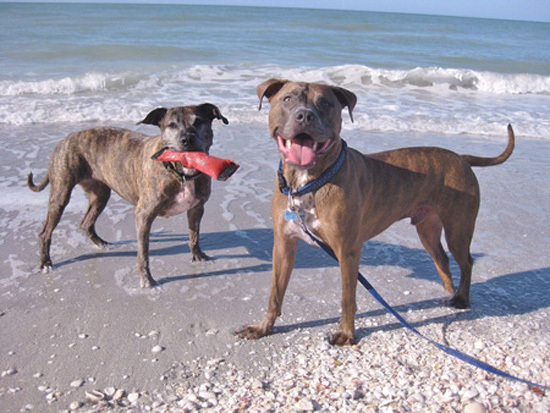 Rocco was the mellow gentleman and Sadie was his feisty lady. They were a perfect pair. Sadie inspired me to get involved with different pit bull rescues and advocacy groups like B-More Dog, Pinups For Pitbulls and StubbyDog. 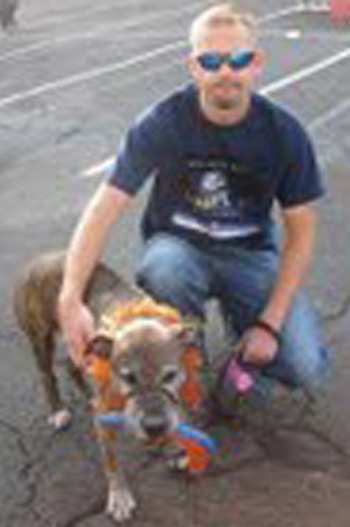 Sadie was fortunate to be chosen as one of the pinup dogs (May 2012) in the Pinups for Pitbulls calendar. She often went out with us to stores or on vacations where people would tell us they’d never met a pit bull type dog and they were surprised how good she was. Sadie loved children and adored our extended family! Sadie was my constant companion. Through my many surgeries and medical diagnoses, Sadie was always right by my side to dry my tears and to remind me to be strong. In her elderbull years, I looked to her as an example. Sadie never complained that her arthritis was bothering her. Even right after having her cancerous spleen removed, she was rolling around on her back ready to play. She was always so happy to be a part of life. In July Sadie had her spleen removed, and was diagnosed with hemangiosarcoma. Sadie was being treated holistically, because being a vet tech and seeing what the dogs go through, I didn’t want to subject her to chemo. She was healthy the last 2 months, until we got ready to leave on vacation for Florida. That morning she was depressed and refused to eat. Sadie never refused food! I took her in and got the worst news of my life. The cancer had spread to her liver and her leg. She was very anemic and tired. I thought about what Sadie would want. So I called my husband crying and broke the news. We decided to hightail it down to Florida one last time. Sadie perked up after being there a day or so. She ate grilled fish at the local restaurants. 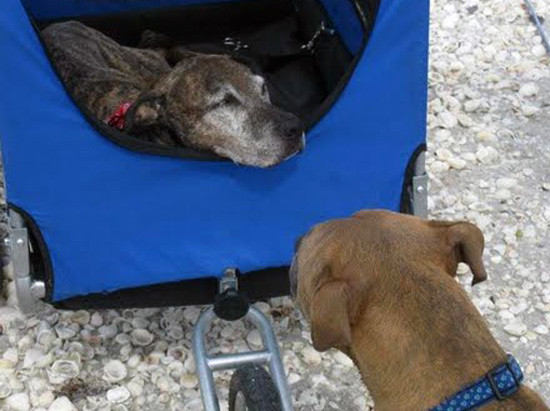 Every day we would push her down to the beach in her elderbull chariot, and she would muster up the energy to play with her toys and walk on the beach. My husband and I would often put the dogs back in the cottage and sit out on the beach alone, crying, knowing that this would be the last time we would ever enjoy this beloved place with our daughter. We got back home late Sunday night and Sadie wasn’t doing well at all. On Tuesday we were both supposed to go back to work but something told Dan not to go. He called me that morning at work, sobbing. Sadie had left this world while in the arms of the person she loved the most. I’m so grateful he was there for her. When I got home Rocco, Henry, and Dan were all standing vigil over her. Rocco had his paw draped over hers. We all said goodbye in our own way. I know it’s something that we will never get over. To some, a dog is a pet. You throw some kibble in a bowl and open the door to let them relieve themselves. And that’s about it. To us a dog is the child we could never have. We cooked for her, took her on vacations, planned our schedules around her, and even declined invitations from family if Sadie wasn’t welcome. Sadie and Rocco are our family!! We will always cherish Sadie and are so thankful that she was a part of our lives.